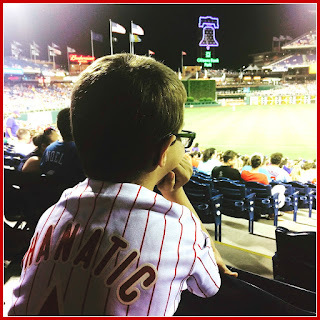 From the first pitch to the ace reliever’s last out, baseball, like America, is rooted in tradition. Some traditions are unique to one team or ballpark, while others are observed all throughout the leagues. This list contains seven of my favorite traditions. In a tradition over 100 years in the making, a notable person will often throw out the first pitch of the ball game. Usually, it's a local celebrity or hero. The tradition began in 1910 when President William Taft threw out the first pitch at the Washington Senators game. After the Senators folded, other teams took turns hosting the President on Opening Day. 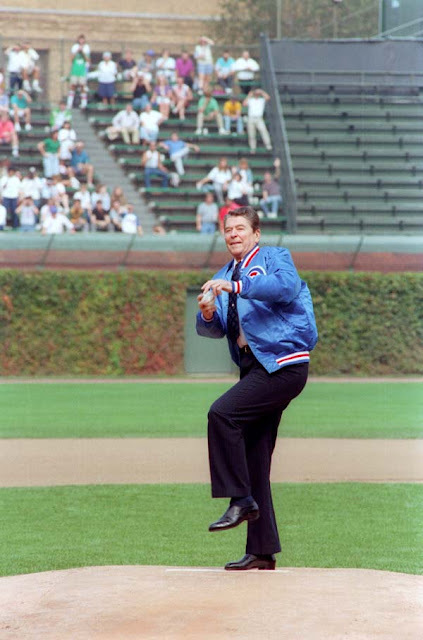 Now that Washington again has a team, the incumbent president usually throws out the ceremonial pitch at the Nationals’ first game. Over the years, the first pitch tradition evolved. Taft tossed the ball to a single specific player, but subsequent Presidents threw it into a group of players who fought over it in a scrum, much like bridesmaids battling over the bouquet at a wedding. In the 1970s, scrumming gave way to the much tamer and safer first infield-to-plate pitches we see today. Today, the ceremonial pitches’ receivers are usually either the team’s mascot or catcher, and nearly every game has a ceremonial pitcher or two. What constitutes baseball food, or stadium food, if you prefer? Peanuts, Crackerjacks, and beer are some of the most traditional games foods. Peanuts and popcorn are easy to eat while you’re distracted by the play on the field, and a cold one with the boys on a hot summer day was easily gotten away with because the wife was at home. But what if you are hungry for more than a snack? Just raise your hand when the hot dog man comes by. But how did hot dogs become synonymous with baseball? Waves of German immigrants in the 1800s brought both their traditional sausages to America, along with their dogs. Legend says sausages on rolls - easy to eat one-handed while watching the game, and more substantial than popcorn to slow the effects of all of those beers - became familiar stadium fare, with sellers carrying insulated bags filled with piping hot sandwiches walking up and down the aisles announcing “Red hots! Get your red hots!” Along the way, someone noticed that the sausages on the bun looked like the long-bodied dachshunds and said the sandwich looked like a hot dog. Newspaper cartoonist Thomas Aloysius "TAD" Dorgan immortalized the comment in a 1906 cartoon, and the name stuck. 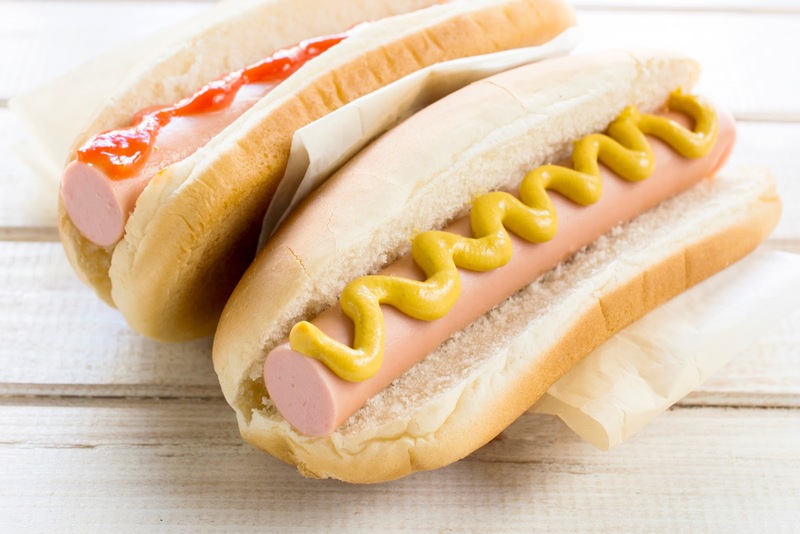 Today, nearly 35 million pounds of hot dogs are served at baseball stadiums. Many stadiums also serve local specialties as well. A fan can eat a lobster roll, a New England favorite, while the Red Sox play at Boston’s Fenway Park, while Anaheim's concessions include “Angel Wings,” the home team's twist on buffalo chicken wings. Nationals Park serves Teddy's Barbeque, a concession featuring images of Theodore Roosevelt and a signature food item—a 13 inches (33 cm) beef short rib called the "Rough Rider. 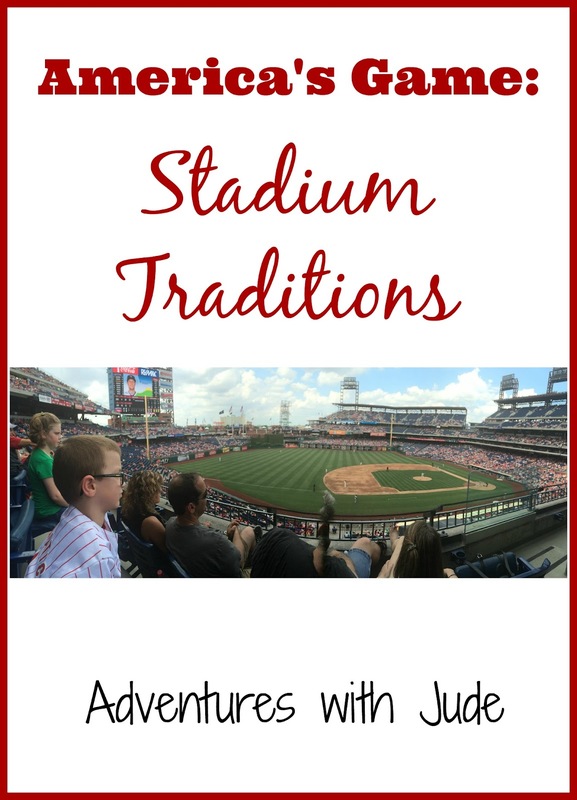 Citizen’s Bank Park, home of the Philadelphia Phillies, resides in not only the “City of Brotherly Love,” but also the “Land of Cheesesteaks and Hoagies,” making these hometown foods a signature game meal. While on the subject of peanuts and Cracker Jack, the anthem of the ballpark, "Take Me Out to the Ball Game," is one all baseball fans know. 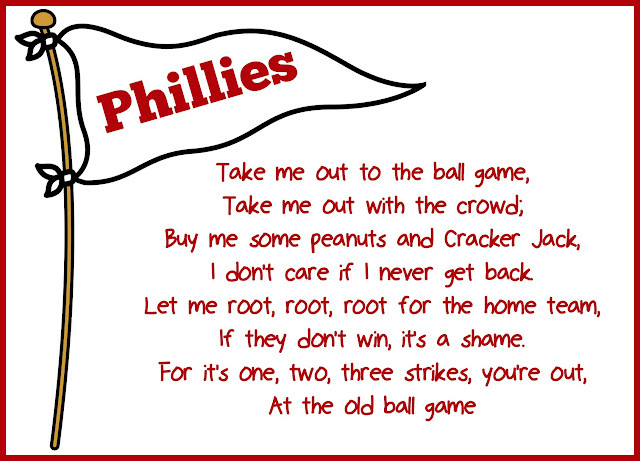 Few know the full song, but everybody who's seen a ball game knows the chorus. This tradition started with Harry Caray. During a mid-inning break, he began singing it to what he thought was a “dead” booth, when White Sox announcer Bill Veeck turned his mic on, broadcasting live to the crowd. When Caray moved to the Cubs and Wrigley Field, it became a tradition and is sung during the 7th inning stretch. After his death in 1998, Wrigley Field continued the sing-along tradition, inviting celebrities to lead the song in Carey’s place. After sitting through 6 and a half innings, you start to feel a little tired; if you haven't gotten up for food (likely since concessions are brought to your seat), then you'll feel like you need to stand up. Legend says that during a 1910 game, the portly President Taft got up to stretch his legs in the middle of the seventh, and out of respect, the crowd stood up, too. Then the rest of the fans realized this little bit of exercise was a pretty good idea, and a tradition was born. In early games, a military band would often be on hand to play a patriotic song -- why the band was ready to strike up The Star Spangled Banner during the 1918 World Series. After getting up and singing "Take Me Out to the Ball Game," people either sit back down or run to grab their final snacks; the 7th Inning Stretch has become the “last call” for food and alcohol purchases. At any other place of business, if you’re handing over money, it’s a one-on-one transaction. You keep an eye on the recipient and count your change along with him. All that is thrown out the window in baseball. To let you watch the game instead of spending half of it in food queues, vendors walk around the stadium, hawking their wares. When one comes by with what you want, you put your hand up (as if hailing a taxi) and holler “Hey ____ Man!” When he stops, you hold up your fingers for how many. The vendor shouts the total as gets your order out, and completing the transaction becomes a group activity. Total strangers will pass money and food to each other. Your food gets handed to the person sitting on the aisle, who in turn passes it down the row, while you start passing the money up the row. If you're due any change, that follows your food. You’d never do this outside of a stadium, but everyone’s trustworthy at a ball game. 6. Watch out for foul balls! If there's one thing kids will bring to the game, it's their baseball gloves. It doesn't matter if you're sitting at the foul line, behind home plate or in the nosebleed sections—the glove comes to the park. After all, you never know where those foul balls might end up, and who doesn’t like a genuine souvenir? Usually, it’s a popped-back foul ball that you’ll catch. If you’re exceptionally lucky, you’ll nab the home run ball knocked out of the park from your home team. Catching a home run from the opposing team, however, feels wrong. Often, the home-run ball from the visiting team gets caught and “thrown back” to the field. The tradition began at Wrigley Field, where so many balls are hit out of the park that it’s not totally crazy to say “I’ll wait for another.” Most fans will keep opposing team balls unless it’s been hit by an arch-rival. Then it becomes almost a greater honor to toss it back than to keep it, even if you never catch another ball in your life. If you were to see a picture of a team’s uniform, would you know what team it represented? Maybe, if you were familiar with team logos. The odds are pretty good, though, if you saw a team’s mascot, you’d know right away who he belonged to. The first baseball mascot was literally “a kid in a chicken suit.” In 1974, a San Diego college student was working a radio gig, promoting the station while dressed in a chicken suit. He enjoyed his first assignments and offered to promote the station at the San Diego Padres games. For five years, he advertised the radio station at games, and while The Famous Chicken eventually parted ways with the radio station, becoming the Padres’ full-time mascot, he was the catalyst for many of the mascots we know today. The next major team to have a mascot was the Philadelphia Phillies. The “Galapagos Island-born” green guy first arrived in Philadelphia in 1978, and is one of the most easily identified Philadelphians -- sometimes being recognized faster than Ben Franklin! Baseball mascots interact with the players and fans, serving as both entertainment and a “goodwill bridge.” Often, the mascots appear at local events; their popularity often guarantees a good turn out. While mascots in and of themselves embody tradition, sometimes they can make traditions themselves. The fourth inning of Washington Nationals home games features the Presidents Race. Caricature and team-uniformed versions of permanent mascots George (Washington), Tom (Jefferson), Abe (Lincoln) and Teddy (Roosevelt), along with a “President of the Year” race around the field and entertain fans. When the Phillies pack for Spring Training, the Phanatic's three wheeler and hot dog launcher are given reserved seating alongside the bats, balls, and uniforms in the truck. What is your favorite part of attending a ball game?